Detached 2 storey 'stable conversion' set within the established grounds of a separate Edwardian House, located in this highly regarded residential location. There is a shared front gravel driveway allowing for ample car parking. A side gate leads on to Hillcrest Stable Conversion, which has it's own private outside space. There are excellent local amenities within a 15 to 20 minute walk away. The entrance door has 2 steps up into the property and the living room is on the first floor via a flight of stairs. Hillcrest can sleep up to 2 persons utilizing the upstairs double bedroom and bathroom / wc. Alternatively a connecting ground floor suite comprising a large bedroom with two single beds and an en-suite bath and shower room containing a low level entry shower, as well as a bath, can be made available , allowing the property to sleep in total a maximum of 4 persons. This bedroom has level entry from a large dining kitchen with seating. Click on ' View Larger Map' under the Google Map on the above webpage and then click on ' Directions' in the left hand side box on the map , then you can plan your journey by entering your own post code and select mode of transport. The nearest bus stop is just a minutes walk away on Willow Brook the road outside this property. To see bus times please consult the Property Manual. Full access details will be emailed to you with our booking confirmation. The property is accessed from Willow Brook, via a dropped kerb and then lockable vehicle entrance gates secured by a padlock being approx at waist height leading to an expansive shared gravel driveway, where guests can park one vehicle. There is a locked side pedestrian gate with a coded cipher lock which is at approx shoulder height with a thumb turn handle. A gravel pathway being well lit by motion sensor lights, leads to a path being mostly gravel, which runs along the side of a brick outbuilding , near the wheelie bin refuse area, attached to the external wall is a further key safe at shoulder height where the keys for the property can be accessed. Then continue along the path for just 10 meters or so, through an unlocked wrought iron gate into the garden area of Hill Crest, turn left to find the front door of the property being well lit by motion sensor lighting. There are two steps up into the entrance of the building. The floor covering is short pile carpet with rugs , apart from the ground floor which tiled. The staircase to the first floor has 13 steps, with a balustrade. The room has a mixture of seating with sofas and soft chairs with non-feather cushions as well as some high chairs with arms, together with a low coffee table. There is a sofa and easy chair with arms, both have non-feather cushions. The dining room / kitchen is situated on the ground floor with level entry from both the hallway. The door openings to the dining room / kitchen from both the hallway are 750mm/29.5ins wide. The dining table has legs on each corner, 600mm/23.6ins from floor to lowest point of table (underspace) and is 750 mm/29.5ins high. The kitchen is situated on the ground floor with step free, level access from the hallway and includes a dining area. The door openings to the kitchen from both the hallway are 750mm/29.5ins wide. The door of the oven drops down and the handle is 700 mm/27.5 ins above the floor. The hob is 920mm/36.6ins above the floor. Fridge freezer available, highest shelf in fridge 1045 mm/41.14ins and lowest drawer in freezer 300 mm/11.8ins. By arrangement there is 1 bedroom with two single beds on the ground floor, with step free level access from the front door and hallway. On the first floor there is 1 room with a king sized bed which are reached by stairs only, and there is one steep step down from the living room into the bedroom. The door to the ground floor bedroom is 750mm/29.5ins wide the other 2 are 750mm/29.5ins wide. Lighting is natural daylight and at night overhead lighting. Bedside lamps are also in each room. 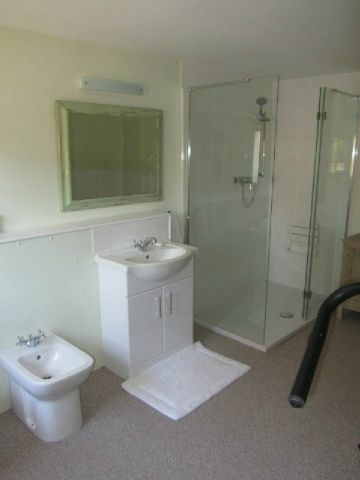 The ground floor bedroom has an en-suite shower room, which has the following: Shower cubicle with low easy access step , wash hand basin, w.c.
An almost level entry, shower is located on the ground floor by arrangement. Step free, level access from the dining kitchen. The door opening to the bathroom upstairs is 750mm/29.5ins wide. The door opening to the bathroom upstairs is 750mm/29.5ins wide. There is a bath with a shower over, wash hand basin and W.C. It has the same lighting and flooring as above.